Whether it is new construction or a building renovation, virtually any project in the $100 billion non-residential construction market involves anchoring. Every application, ranging from hanging acoustical ceilings and installing window and door frames to performing seismic upgrades, requires the use of an anchoring product. While Cast-in-place anchors have been used in the past to attain high load capacities, positioning them into form work is difficult and alignment errors are common. Typically, 25% to 30% of cast-in-place anchors are either misplaced or omitted completely. ​ Forced-entry fasteners driven by hand, pneumatic tool or powder-actuated tools are driven directly into the base material without pre-drilling. However, they should use only for light duty, static load applications. 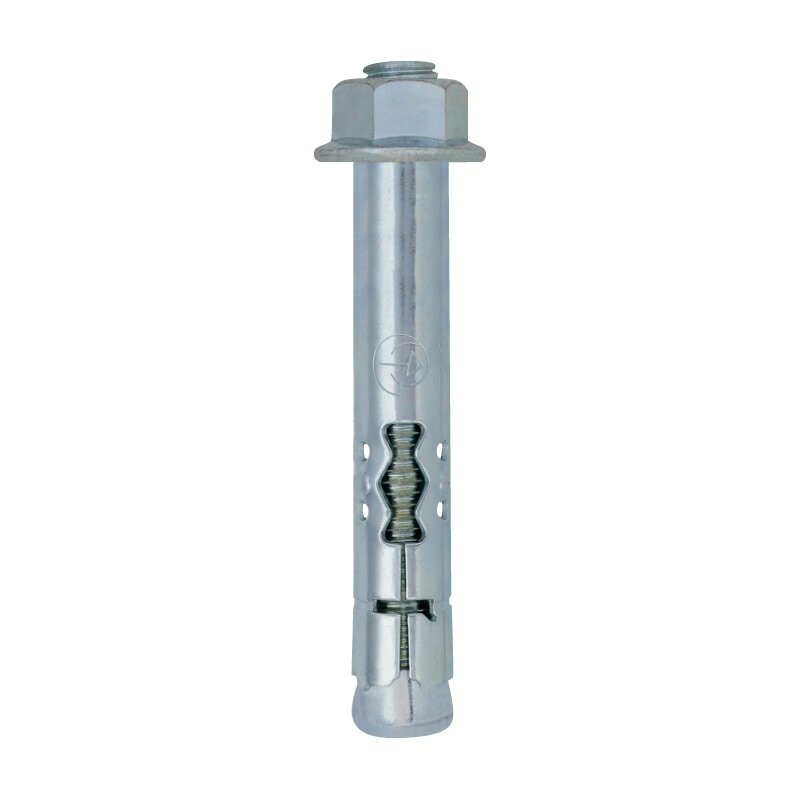 Mechanical expansion anchors usually can be loaded immediately after installation, an advantage versus bonded anchors that must cure prior to loading. 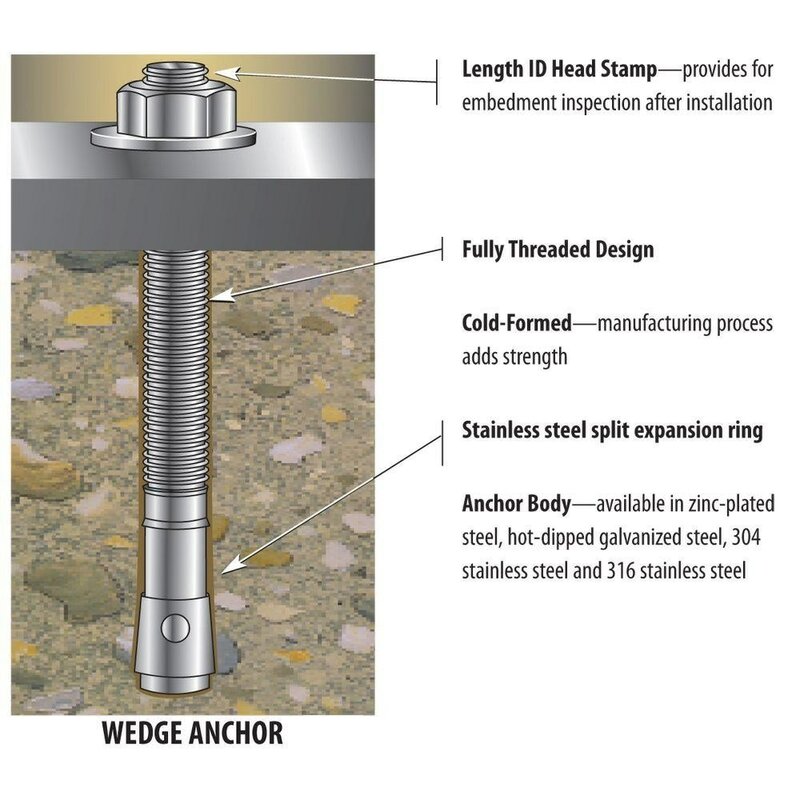 Steel expansion anchors generally have better resistance to heat or fire when compared to bonded anchors that use ester-based resins or epoxies. Anchors of this type can be distinguished by their style and method of expansion. One-step anchors do not require layout or hole-spotting since the drilled hole required is the same size as the anchor diameter. 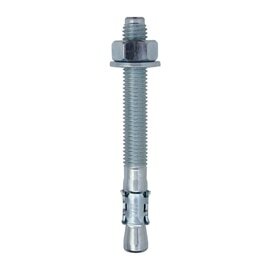 Bolt or screw anchors are installed flush with the surface of the base material and have internal threads to accept a bolt, screw or threaded rod. Hollow wall anchors are specifically designed for applications in hollow base materials such as wallboard, concrete plank, block and structural clay tile. Mechanical expansion anchors achieve their load capacities based on friction, clamping, compression, undercutting or a combination of methods. 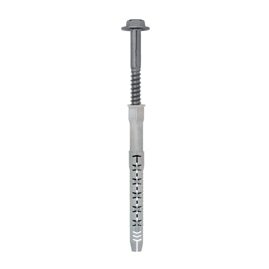 Friction anchors such as concrete screw anchors do not expand but develop load capacity by creating a friction force between the shank of the anchor and the base material as they are driven into an undersized hole. Anchors of this type are generally suitable for light-duty, static load conditions. 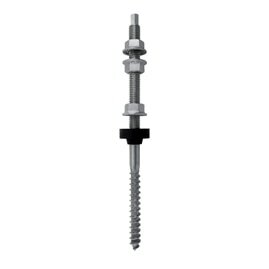 Clamping anchors such as toggles achieve their capacities by clamping the fixture to the base material. Tension loads are developed by spreading the load over the back face of the hollow material such as concrete block. Most drilled-in mechanical anchors can be described as compression anchors. They have an expansion device-such as a sleeve, slotted shell or wedge assembly-that, when mechanically expanded, compresses against the wall of a drilled hole. 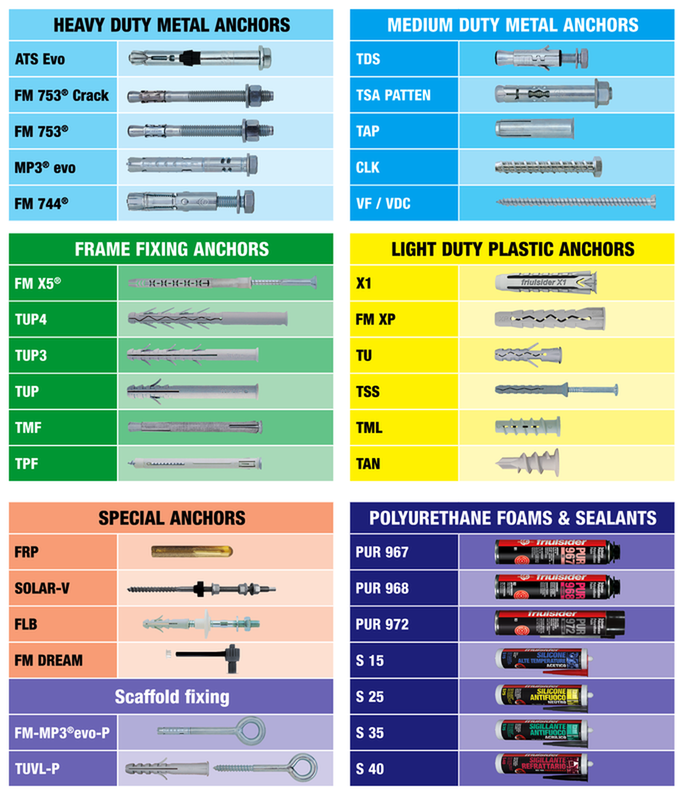 Some types of compression anchors, pre-expanded to eliminate the need for secondary setting operations, decreasing the total installation time. The one-piece anchor is installed as follows: Drill a hole, place the anchor through a fixture hole and drive it in. As Undercut anchors expand at the anchor is driven, the mechanism compresses to the size of the hole. Bottom of the anchor hole, similar to a standard compression anchor, except that the diameter of the expanded area is wider than the drilled hole. Anchors of this type can be self-undercutting or may require a second operation to form the undercut. During installation, the expansion mechanism undercuts the base material to form a large bearing area. 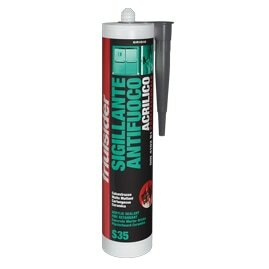 This allows higher loads to be transferred to the base and permits undercut anchors to be used in cracked concrete. For increased performance and resistance to vibratory loads, some styles of undercut anchors expand at two levels, both in the anchor sleeve and cone. Friulsider S.p.A, established in 1966, has expanded rapidly over the years and now occupies an area of 61,000 m2 (23.000 m2 under cover) made up of various offices, warehouses and a recently expanded production area. The production of all references, in steel and plastic, is carried out in-house, to ensure the quality of a "made in Italy" product and to rapidly respond to all of the market demands, from construction to plant engineering, from mechanical industry to carpentry. Continuously searching for innovative technological solutions, Friulsider constantly expands and evolves its product range, which now includes a total of 5800 articles, divided into Mechanical anchors, roofing and cladding fixings, wood screws, nuts and bolts for metal. 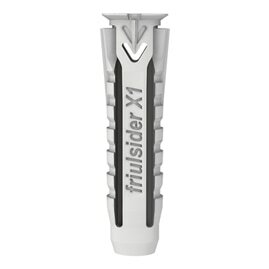 Friulsider, always attentive to technological innovation, has an avant-garde design structure equipped with the latest 3D CAD tools. This enables the continuous development of projects for new and more evolved products as well as process technologies necessary for their industrialisation. The products are tested in the sophisticated and unique in Italy "Test Laboratory", where the validity of the theoretical models is verified and certifying of technical and functional characteristics is carried out. The laboratory is equipped for the full scale ETA testing procedure on any type of base material, including cracked concrete, and performs tests up to a pull-out value of 500kn. 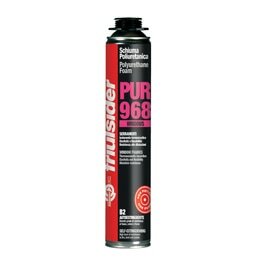 Friulsider's wide range of products all cater to different types of customers, i.e. residential, commercial and industrial alike. Over the years, Friulsider has earned a prestigious position on the Italian and international markets. Present with its products in more than 30 countries, the constant growth of the company, especially in a period of remarkable economic competition, testifies the validity of the offering and excellent quality of the Friulsider product, which continues to dominate and win the confidence of all its clients.